The Allegheny Mountains extend 400 miles across four states. In this region, trade and settlement occurred mostly along waterways until railroads were built for coal, lumbering, and passengers. In the days of steam, gear-driven locomotives were needed for logging these mountains and massive, articulated locomotives hauled heavy coal trains. Those who traveled these Allegheny rails by passenger trains returned home with an appreciation of the natural beauty of this part of our country. 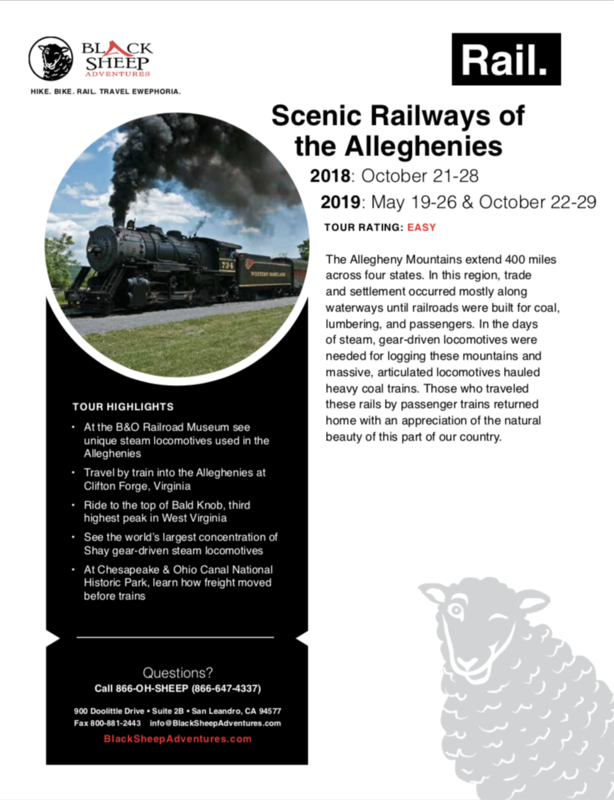 Our premier east coast train trip through the Alleghenies region will treat you to an insiders view of an incredible part of rail history. This modern all-suite hotel is a quick walk to Baltimore’s Inner Harbor. All rooms feature full kitchens, dining tables and sitting areas with pull-out sofas, as well as free WiFi and flat-screen TVs. There is also a 24-hour fitness on site. Located across the street from the famed Jefferson Pools which were built in the 1760s the inn transports you back in time to the late 1800s. The individually decorated, low-key rooms are set in 3 different buildings on the property and have en suite bathrooms, satellite TV and free WiFi. This hotel provides the perfect base for discovering everything this beautiful mountain town has to offer and offers easy access to Cumberland, MD. The relaxed rooms include free WiFi and custom-designed beds, as well as flat-screen TVs with HD channels, minifridges, microwaves and coffeemakers. The hotel is located on a quiet 12-acre site near historic Shepherdstown, WV. Rooms have a radio, hair dryer, iron and ironing board, 32" flat screen TV, bath amenities and high-speed wireless internet access. Also the hotel features a full cardio room, weight room, indoor track, full non-air-conditioned gymnasium, sauna, steam room, outdoor Jacuzzi, and seasonal pool. On May 22, 1830, a horse-drawn Baltimore & Ohio train traveling 13 miles to Ellicott City began the first regular railroad passenger service in America. The Baltimore & Ohio collected locomotives and other artifacts of its history and in 1953 opened the B&O Museum, where our tour begins. In the afternoon we visit a few of the city’s many active and former railroad stations; some of which are renowned architectural landmarks. This morning we travel beside the Greenbrier River on the “Rocket” powered by a rare Climax locomotive built in 1910. Afterward, we traverse rural highways through the scenic mountain country that makes up the north half of West Virginia, stopping along the way to see two remnant stands of trees that escaped logging– one Spruce; the other, Hemlock. They offer a glimpse into what the original forests of West Virginia were like. This morning’s trip on the Western Maryland Scenic Railroad begins at an imposing office building and station in Cumberland, Maryland, built in 1913. The building, now the centerpiece of Canal Place State Park, also houses a visitor center for Chesapeake & Ohio Canal National Historical Park. WMSRR’s roster includes C&O 2-6+6-2 no. 1309, the largest steam locomotive operating in the eastern United States. This afternoon we visit vestiges of the Western Maryland Railway in the eastern Alleghenies on our way to Shepherdstown, WV. Day 7 — The Capitol Limited to Washington, D.C.
Day 8 — Departures from Washington, D.C.